Regular readers of Beat already know that bassist Mike Watt has a talent for photography. 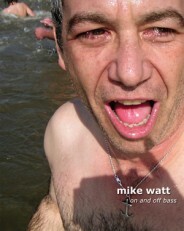 But if one pic a week isn’t enough for you, we heartily recommend you pick up a copy of mike watt: on and off bass, coming in May from Three Rooms Press. The book is available for pre-order starting tomorrow, April 1. Watt will also be reading from the book, signing copies and performing with his trio the Missingmen on Saturday, May 5 at 2pm for Cinco De Mike Watt , the official West Coast launch party, at Beyond Baroque. Also appearing will be Jack Brewer and S.A. Griffin’s literate-rock project the Lofty Canaanites. The book will be available for sale, along with original prints from Track 16 Gallery, which sponsored the original exhibit that inspired the book. But LA Beat readers will have the opportunity to win one of these coveted prints, autographed by the artist. Just leave a comment at the bottom of this piece with your favorite Watt thing. It could be a favorite song, a memory of seeing him play live, something funny he said from the stage one night, your favorite Pic Of The Week, a story about running into him at a Frankie Goes To Hollywood show, anything at all. You’ll have to sign in with your email address but we’ll keep it confidential and never use your information for other purposes. Five winners will be chosen at random. Deadline for entries will be Sunday, May 6 and winners will be announced on May 7. See also our Spielgusher review and our photo gallery/ CD review with the first photos of fIREHOSE in 2012. UPDATE: Winners have been privately notified with the exception of commenter Salley, whose email address given has failed twice. If you are Salley, please write to me at bobzilla77@gmail.com and be sure to include the email address you originally gave us so we know it’s you. This entry was posted in Books, Music. Bookmark the permalink. Watt jamming econo, konking on my couch inDC. Talking life and politics over eggs at the house just after 9/11. Good times. Watching Jackass for the first time and hearing Corona. It through me for a loop. I didn’t figure that I’d hear a song from one of my favorite bands introducing craziness..
since I know him, I have a band. and try to eat my lunch at noon break. Wow! There’s no way to pick just one favorite Watt thing/moment. Every time Watt would come to Nebraska (where I grew up) he would take pride in stating that D. Boon’s family was from there. I once asked Watt (as he sold me a T-shirt from the stage) why Volvo was using a Minutemen song in a commercial (!) as this seemed to be counter to D. Boon’s lyrics & message (as I interpreted them at least). Watt told me that D. Boon’s dad was sick & needed health care but that since D. was gone, he couldn’t be there for his pop. Instead, they decided to use what D. had already done (Love Jam off of Double Nickels) to help out. At that moment I realized that Watt was a kind enough man to stop & explain some extremely personal stuff to a complete stranger like me. What business did *I* have to ask this man about something like that? Luckily, Watt is a good man & took the time to explain things to a fan. Much respect Watt. club congress, tucson az, fall 1987. snuck into club with my “twin” brother who was 21, I was 17, but our social sec. #’s are so close together how could we NOT be twins! maybe 20 people there that night. ate mexican food with the boys post show. what a night, what a memory. I can’t wait to see them again in the stomping grounds april 19, youch, 25 years later. My wife and I used Corona as intro music at our wedding; it balanced out all the other wedding music nicely! I loved it before those J-Asses guys got hold of it. Watt has always been a constant from Minutemen thru this solo stuff. I love MW’s EB-O and EB-3 basses because I love the SG shape. Mike Watt “ball-hog” album was a pivotal moment in music for me. So many guest artist, and each song being amazing. Also around this release date, Mike hosted a bunch of “120 minutes” on MTV. I had never heard of him before this, and I’m so thankful I saw those episodes. Watt changed my life, making me realize punk could be something besides just straight ahead supercharged ’50s rock ‘n’ roll. I learned the word “angular” as a result of reading early fanzine reviews of “Paranoid Time.” Then I went and saw them live and I was sold for good. I pursued Watt for years after that, trying to get him to come play with my little band. I finally succeeded after all the pestering, and we did play with my heroes. They were transcendent, as per usual. We were awful, which broke my heart at the time. But all these years later I’m just proud to be able to say I shared the stage with Watt, Hurley and Boon. Thanks for the education, all the sweat, and the beautiful riffage, Sir Watt. I took an uninitiated friend to a Watt gig a few years ago. He did some between-song spiel about taking charge of your own life and getting the boot off your neck. The next day, my buddy quit her job, broke the lease on her apartment, and got seriously busy removing the boot and jamming her own kind of econo. The East vs. West show (Ramones V. Black Flag) at the Hollywood Palladium, where the Minutemen stole the show. I’m sure eventually I would have found fIREHOSE on my own, but I was introduced to them by my brother, who still to this day listens to Boston. He bought me my first fIREHOSE tape, “FromOhio”. He had never heard of them but just thought it was a weird name for a band and bought it for me for Christmas. Thanks bro! Lyrics to “My Heart and the Real World”. Incredible. And also, meeting Watt after a show, freaking out and telling him he was my hero. He gave me a sticker. I like when I get Watt’s voicemail, it’s him saying, “You’re tuggin’ on Watt’s leash”. “Peas and carrots, peas and carrots. ” From the movie Rising Low. Wake and Watt in Goleto… finally got over myself. His bands changed my life. First time I saw him was also the night I met my bf at his show. What a great memory! I had the pleasure of seeing the minutemen – duo open up for shellac about 7 years ago and they were Fantastic … mind you since then I have seen Watt 10+ times with the stooges and he always kicks out the jams – happy days ! Mike Watt is my favorite Mike Watt thing. Two memories stand out. the first time I met Mike in person was in San Diego after the Ball Hog or Tugboat show (with Foo Fighters and Hovercraft.) I bumped into him out back and found he was really ill and that everybody in both the bands and crew had contracted a severe flu bug. I helped him put away his some of his gear and sick as he was he made sure and took time to talk to me for as ling as I wanted. The second time was backstage at a Prono For Pyros show in New Orleans, Mike and I chatted outside the main dressing room while Perry and the boys had some “private” time. I picked Mike’s brain on one subject and one subject alone: Blue Oyster Cult. Can’t wait for 3 fIREHOSE gigs in 10 days! It’s like 1992 all over again. Got to meet The Man in a Van with a Bass in his Hand a couple times in the last couple years, after a great Missingmen gig in Hoboken and after the LACMA event. An inspiration all around! My favorite Mike Watt lyrics from The Boilerman “‘member you meetin’ me? Smoking a cigar as he came onstage w the other fIREHOSE guys and attempted to tuck it into his tuning pegs, unsuccessfully. This was fIREHOSE opening for the Beastie Boys at First Avenue in Mpls, ’93 or so? I’ve got two. One is of the second day of the Hyphenated-Man tour they were playing in Echo Park. I really wanted to go but my wife was in the hospital. I wasn’t sure that I’d be able to make the gig. I was on my bike riding out to join her and my path took me past The Echo where they were playing. As I rode by Watt was standing outside about to soundcheck. I stopped and chatted with him for a few. Took a picture with him and told him I would try to get back for the show. I finished my ride, got my wife and flew home. I managed to make it to the gig just as the first song started. Close one! After the show I talked briefly with Watt about D. Boon and the recording of “Double Nickels”. Best part though was that he remembered me from earlier in the day and asked how my wife was. That was very special to me. Made my wife’s night too when I told her. Second moment was at the same venue to see The Hanson Brothers. Went outside with my friend to have a smoke and there’s Mike Watt! My friend is from Pedro too so we started chatting with Watt and he started telling us stories of the old days. I was in heaven. We went back inside to watch a band, then back out again in between sets. When we got outside again Watt came over to hang and chat with us again! What a night! Chatting with Watt and watching John Wright on bass. Watt is THE major influence on my music. Much, much respect! He is the most genuine, humble and appreciative musician I’ve met. Been selling mersh from stage since the first time I saw him play and was blown away…still am. 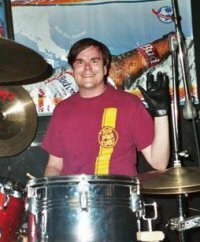 June, ten years ago: end of the secondmen tour, Casbah San Diego, drum kick goes and gets -cracked- mid-song. Watt goes to the mic asking is there a doctor in the house. Dude in crowd says he can run up the street and grab one from his pad. Watt takes him up on it. Place goes into break mode. I sidle up to Watt at the stage, bring up my buddy Steve from Columbus, whose couch Watt crashed on a month ago — but Watt remembers me! What? From Boston. “Yeah! I’m Pedro!” “No – Peedro!” Right on. Drum kick #2 appears. Show back on. Boom. 100 Watt moment. Quoting my love of the minutemen, fIREHOSE and Mike Watt in particular won me a scholarship to Oberlin back in 1992. I was a real fan, had all the minutemen and fIREHOSE albums, and was lucky enough to catch fIREHOSE at Maxwell’s in Hoboken in 1991 (I also saw Watt perform in NYC in 1997, and just saw Hell Ride last night in NYC: AWESOME). My competition sitting in the waiting room overheard my spiel to the committee about Watt and told me, “You’ll never win it with that music stuff.” But I did. Turns out a dude on the committee was a fan. Woot! I wanted to tell Mr. Watt last night after the show, but I chickened out with a, “so honored to meet you.” I almost bowed too. Minutemen play Subterranea on Main st.
D.Boon jumps up and down until the stage collapses. Everyone stops playing except Watt. What a great birthday present!